Acrylic, ink and charcoal on 300 gsm. paper, 50cm. x 70cm. I have come to regard memory – like my process of abstract painting – as never fixed, always in flux and infused by the multitude of present moments of recollection. Memories – or the affective experiences that stimulate the memories – remain as invisible guides in my work, or perhaps are embodied within it. Laying down images then intuitively erasing or overpainting to form new images suggests a link between creativity and memory itself. Such a process of revising previous events, renders memory as active and always partially elusive. Acrylic on 300 gsm. paper, 50cm. x 70cm. A moment in time, gone now; all that is left is it’s affective impression. Early morning sunlight streaming through a window to mark the beginning of another glorious day in an otherwise, drab Welsh council house. The sun’s brilliant light refracting through panes and its kaleidoscopic brilliance reflecting off everything within. A dazzling start to a new day. As ever,all seemed well with the world. Oh! that is rather a clichèd phrase. Modern communications technology instantly and constantly remind me that all is never well with the world. Nevertheless my world remains full of such “stolen moments”. Is it too much to expect that in 2017, all may be well in the world. 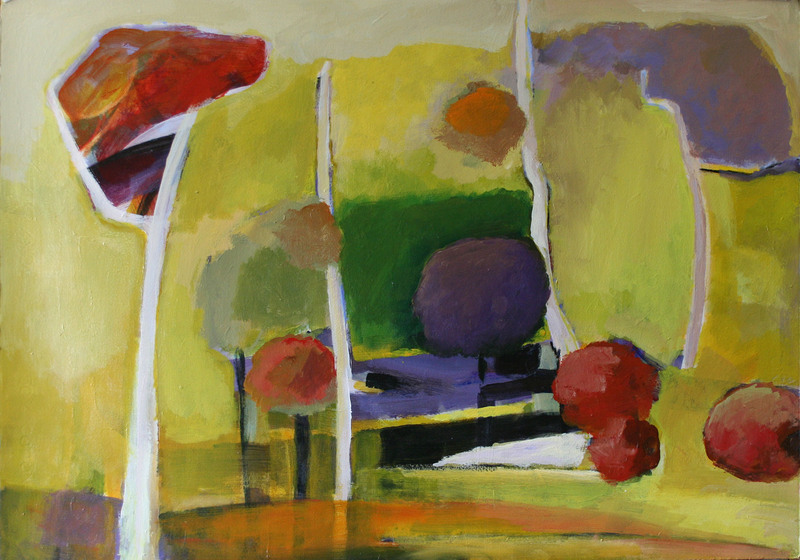 Continuing as a development from earlier works, even so, I consider this painting to be an ‘Intuitive Abstraction’. Obviously my mind must have been pre-programmed by what I had painted earlier, yet it was not a planned image. Not until a certain stage in the painting process did I decide on a final image, at which point, the ‘left side’ of my brain collaborates with its opposite, working towards the final picture. Then I have to decide what it all means to me. What it may convey to the viewer may be something completely different. To me, it is an intuitive response to what has gone before, touching on the complex process of memory and its affinity with abstract painting. I am pleased with the result. Boyhood memories of “scrumping”, an exciting, albeit unlawful, seasonal pursuit where young village boys would secretly raid farmers orchards with the goal of pilfering apples. There was always the danger of being caught. I begin painting with a process of applying multiple layers of colours and random shapes with no focus on the structure or any plan for the final image. This process continues until my emotional responses inform me of the possible subject. The viewer may question, “Why the lack of figures in a painting with such a theme”? However the old artist remembering, does not see himself or his friends, rather it is the emotional experience only, that is keenly remembered. In hindsight it seems the memories may also reflect on the theme of property versus place, where land is always owned and adventurous boys always trespassers. 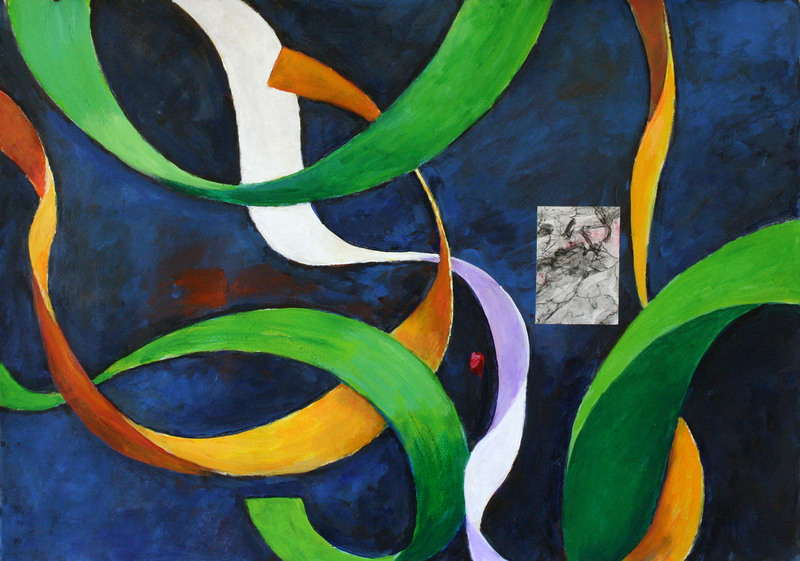 Two distinct, endless ribbons intimately interconnected and eternally linked, suggesting life’s complex pathways and our need for supportive relationships through such a labyrinthine journey. Acrylic on paper, 50cm. x 75cm. (2016).